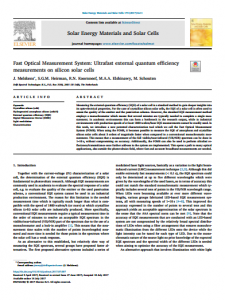 The Fourier Optical Measurement System (FOMS) is a tool for assessing the Quantum Efficiency of solar cells. Its unique design allows for a full determination of the EQE curve in mere seconds. This makes FOMS 2 to 3 orders of magnitude faster than current EQE systems. In addition to EQE of solar cells, FOMS can perform reflectance and transmittance measurements of (solar cell) materials. This makes FOMS a very versatile instrument for PV R&D, allowing you to quickly and reliably perform experiments under the same, controlled conditions. The working principle of our system, along with results of measurements on various different cells, has been presented in our paper Fast Optical Measurement System: Ultrafast external quantum efficiency measurements on silicon solar cells, published in Solar Energy Materials and Solar Cells. The paper can be found here. For detailed product information, customization and support options and pricing, please contact us.